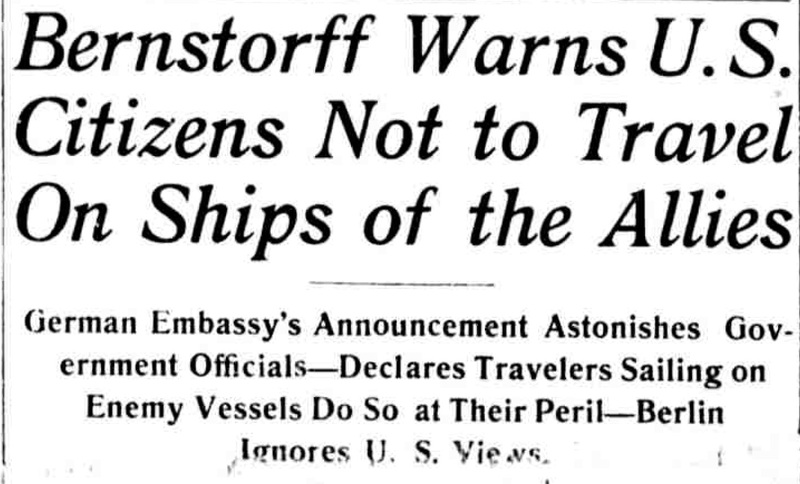 On April 22, 1915, the German government issued a warning to passengers intending to travel across the Atlantic on any British ship. On May 1, 1915, the warning was published in various U.S. newspapers. Despite the warning, over 1,200 passengers set sail from New York that day aboard the Cunard ocean liner Lusitania. On May 7, a German submarine torpedoed the ship off the Irish coast. The ship sank completely within eighteen minutes, killing 1,195 of the 1,959 passengers and crew on board, including 128 Americans. Public outcry followed, threatening the neutrality of the United States in the war raging in Europe. 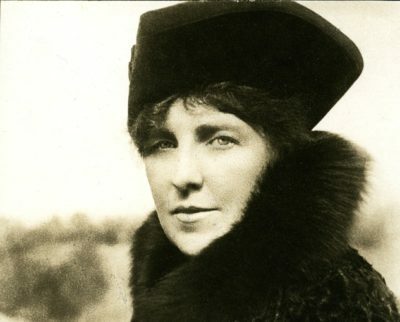 One of the few Connecticut survivors of the Lusitania was Theodate Pope, the pioneering woman architect from Farmington. Neither her maid, Jessie Robinson, nor her traveling companion, Edwin Friend, survived. To what extent has the United States succeeded in remaining neutral in times of war or global conflict? Why did so many people take the risk of sailing aboard the Lusitania on May 1, 1915? Did the sinking of the Lusitania make it inevitable that the United States would enter World War I? How did people in Connecticut receive information about the sinking of the Lusitania? What kind of information did they receive? The Washington Times. May 1, 1915. 1:5-6. Chronicling America: Historic American Newspapers. Library of Congress. “Cunarder Lusitania Sunk by Torpedo off Coast of Ireland; Passengers Safe.” the Bridgeport Evening Farmer. May 7, 1915. 1:1-7. Chronicling America: Historic American Newspapers. Library of Congress. 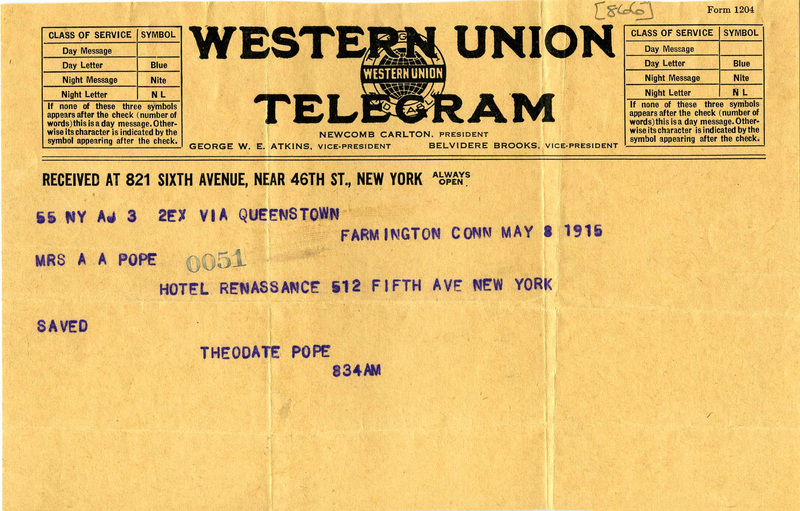 Telegram sent by Theodate Pope to her mother, May 8, 1915. Hill-Stead Museum. The Bridgeport Evening Farmer. May 8, 1915. 4:1, 4-5, 6-7. Chronicling America: Historic American Newspapers. Library of Congress. 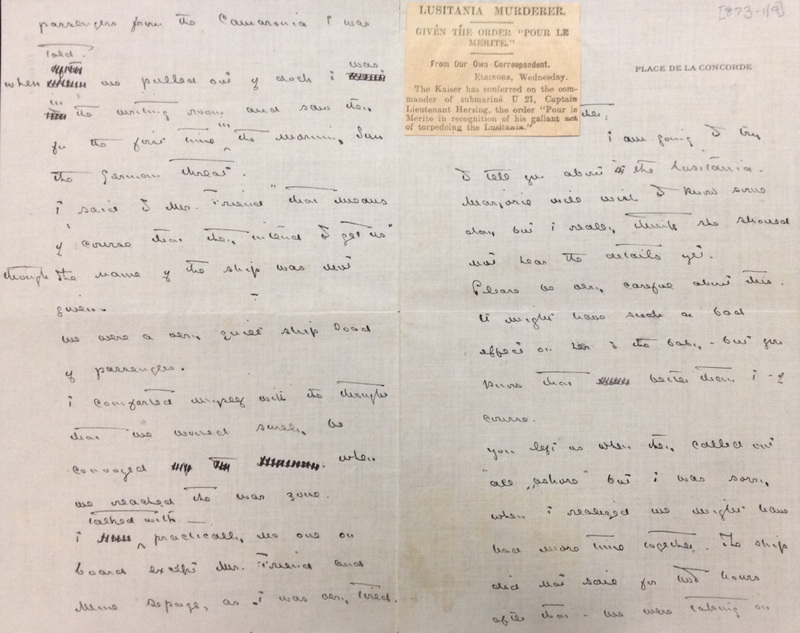 First page of the letter sent by Theodate Pope to her mother, June 28, 1915. Hill-Stead Museum. Portrait of Theodate Pope, taken shortly after her survival of the sinking of the Lusitania, 1915. Hill-Stead Museum. Introduce the compelling and supporting questions for the activity. OBSERVE: What information can they gather from the articles? REFLECT: What do they think based on what they have read? What can they guess or infer? QUESTION: What do these articles make them wonder? You may want to use the Library of Congress Primary Source Analysis worksheet to help students organize and record their thoughts. Compile a list of new student-generated questions that arise from your discussion. Students will read some or all of the front page coverage of the attack on the Lusitania from the Bridgeport Evening Farmer, May 7, 1915 (Source #2). Students will compile a list of “facts” recorded in the newspaper on the day of the event, which can then be checked against later sources. Students will look at Theodate Pope’s telegram to her mother from the day following the sinking of the Lusitania (Source #3). What information does Pope provide? Students will explore the coverage of the Lusitania from page 4 of the Bridgeport Evening Farmer, May 8, 1915 (Source #4). You may wish to assign different articles or page columns to different individuals or pairs. Ask students to analyze the source using the same Library of Congress OBSERVE, REFLECT, QUESTION method as above and then share their results with their classmates. Add additional student-generated questions to your list and look back to see if any information has emerged to help answer the earlier questions. Share the portrait of Theodate Pope (Source #6) and the letter she wrote to her mother (Source #5). Using the Library of Congress worksheet or another analysis method of your choice, have students examine the letter. What “facts” does Pope record, and how does it fit in with other information available relating to the event? What emotions, feelings, or personal reflections does she share? What questions do students still have after reading the letter? Circle back to your list of questions and the compelling question and discuss possible approaches for additional inquiry. Using the sources provided in the toolkit as background (along with any other related primary or secondary sources you wish to use,) students will imagine themselves as a Connecticut relative of one of the Lusitania victims and will write a letter to President Woodrow Wilson arguing for or against U.S. entry into the war in the days following the event. Students will explore media coverage of other large-scale disasters or acts of war throughout American history and will seek out other examples of initially reported “facts” that proved incorrect. Students will then reflect on media coverage of current events and discuss the importance of media literacy in our contemporary world. Cunard Advertisement for Atlantic crossings, including the Lusitania’s May 1 departure and planned May 29 departure. The Sun. New York, NY. April 25, 1915. 12:8. Chronicling America: Historic American Newspapers. Library of Congress. “1,510 Passengers on Lusitania Get German Warning.” The Evening World. New York, NY. May 1, 1915. 1:4. Chronicling America: Historic American Newspapers. Library of Congress. “Lusitania Death List 1,216; Five Bridgeporters Missing.” The Bridgeport Evening Farmer. May 8, 1915. 1:1-7. Chronicling America: Historic American Newspapers. Library of Congress. “Millions in Bridgeport Goods Lost.” The Bridgeport Evening Farmer, May 8, 1915. 1:6. Chronicling America: Historic American Newspapers. Library of Congress. “Learning about the Lusitania: How Hartford Heard the News” by Karen DePauw for Your Public Media. “Theodate Pope Riddle: Connecticut’s Pioneering Woman Architect” by Nancy Finlay.